Our Story, Gluten Free Diet | Ethel's Baking Co.
Ethel’s Baking Co. is a premier baking company, spreading decadence that just happens to be gluten free. Our company was founded in 2011 by Jill Bommarito, with the intention of providing superior, old fashioned baked goods in the market place, getting them to the consumer as quickly and conveniently as possible. The idea for Ethel’s came about when Jill hosted her first Christmas dinner for the extended family. Celiac Disease has been in her family for over 30 years. Many members had bemoaned the necessary gluten free options in the past. Jill decided to make a complete dinner that no one would know was perfect for a gluten free diet, topping it off with the now famous Pecan Dandy Bars for dessert. When the gluten-full as well as the gluten free indulged and raved further, the idea for Ethel’s came to life. 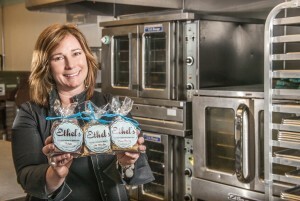 Ethel’s goal is to grow our product line nationwide for those individuals and families who desire a gluten free diet. In stores our baked goods are typically offered in the fresh baked areas, often along with traditional baked goods. Many of our passionate followers have no gluten intolerance of any kind. The idea that those with intolerance or choosing a gluten free lifestyle can purchase “real” food, reminiscent of the goodness they grew up with, has been a very powerful force and created an extremely loyal customer following. We are committed to making a difference in the world of food and the world at large. Our team is here to provide the best customer service to grow our relationship with our stores, and ultimately spread more joy by sharing Ethel’s.